Agile has been described as a change in mindset, which is a tricky concept to explain and even trickier to do. What if agile is additive instead? If we only had a butter knife in our kitchen, there would be some tasks that we can do very well, such as spread butter and jam on bread. Imagine if we wanted to chop up tomatoes. The tomatoes would be in very big chunks and it would be very messy with a lot of waste. Then we discover the chef’s knife and learn how to use it. Now we can chop tomatoes (and other things) with a lot more precision and much less waste. We do not get rid of our butter knife though (I imagine that trying to spread butter on soft bread with a chef’s knife will result in a very torn and unpalatable result). Now we can do many more tasks in the kitchen, using the tool that is best suited for the job and the main changes we have made is to purchase the chef’s knife and learn how to use it properly – which is a case of ‘both/and’ not ‘instead of’. 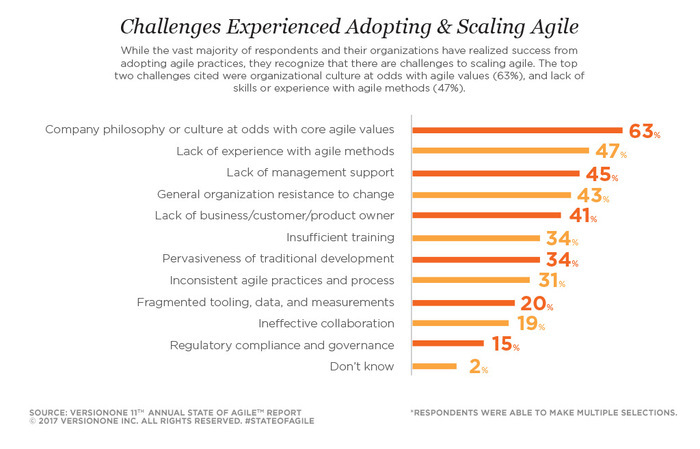 The 12th State of Agile report from VersionOne has just been released, below is some data from the 11th (2017) report about the challenges experienced adopting and scaling agile. Back to our chef’s knife analogy – it would be unwise of us to purchase one and start waving it around – they can be quite hefty and very sharp things. If used inappropriately, they can be very dangerous. We need to start slowly and learn how to use it until our muscle memory kicks in and then we can go a bit faster. It’s the same with learning new ways of working – we need to know when it’s appropriate to use them and be careful that we don’t cause unintended damage as we build our ‘muscle memory’ and get used to the new practices, principles and techniques. It’s interesting in the state of agile report data above that 2 factors appear that we can address in fairly obvious ways with training, coaching and deliberate practice. The remaining 10 factors have a lot more complexity and uncertainty to them and will be much trickier to influence. If we stop thinking of agile as a change in mindset and see it instead as learning a new set of tools, perhaps that would help us to focus on the 2 factors above and reduce the impact of the other 10 at the same time. It’s nice to get new things – and even nicer when we can still find uses for those items we have grown to love (like a favourite butter knife). This entry was posted in Assumptions, Change, Learning by kb2bkb. Bookmark the permalink.